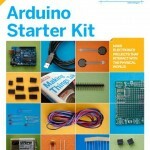 Update: A useful comparison chart of Arduino Starter kits has been posted (by me) at ConductiveResistance.com. I invite you to check it out there. When I wrote the first part of this series, I didn’t plan for it to be a series. I was just thinking about a couple of Electronics companies that I like that sold a product that I like. It turns out though, that there’s a deeper need for this kind of article. A mostly-comprehensive look at Arduino sets that will spell out what has what, and how they compare. I got one concern that I’d only looked at American companies. So I’ve dove in and I’m giving you no fewer than 5 more Arduino starter kits. Two more from North American providers, and Three from European providers. All different, and all cool. We’ll see if we can get a good list to help folks out. Disclaimers: I wrote this over two weeks. I tried my best to make it look nice, and be readable. Sorry if it’s not. Also, I started out with 4 European provides, but only ended up with 3. They’re all actually from the UK. I hope that doesn’t cheese anyone off. Anyway, on with it all. First, let me say that looking at some of these kits, it’s clear that “Starter” doesn’t mean the same thing to everyone. To some, it means “Beginner”, to others it means “Introductory”. The difference is that some kits are put together for the person who’s not familiar with Arduino and how it works. 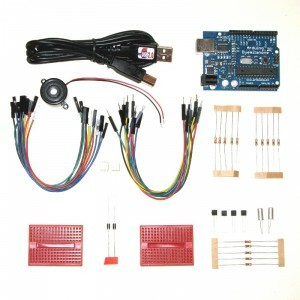 Other kits are built to get you up and running with an Arduino. They give you lots to work with, cool things to do, but not the know-how or “already have”-ness that you get from being an Electronics hobbiest. I’m not going to differentiate here, except in the conclusion, where I’ll lay out which kits seem to fall into which category. All kits contain an Arduino Duemilanove board with an ATMega328 unless otherwise noted. The Cool Components starter kit is a neat looking kit, and has a few surprises in it. Forgive me for the pun, it definitely has some cool components in it. It weighs in at $80.10 (US), They’re based in the UK though, so you’re probably expecting something in pounds: £48.22 is the magic number. 1 x USB cable – This is kind of a given… Looks to be 3′ from the picture. 2 x Mini breadboards – I expected 1, two sweetens the deal here. You can either work on two small projects, or have on projects separated into sections. I like this. 1 x Male & Female Jumper Leads – I think the 1x refers to “1 pack of jumpers” The photo looks to have about 10 of them. While Male jumpers are fantastic, I’m not sure how Female jumpers are going to be put to use here. You could connect the directly to the sensors, but then you’ll still have to use Male jumpers to connect them the Arduino, or to the Breadboard. 6 x LEDs (mix of red, green, yellow) – A good mix of LEDs, nothing special though. Resistors (220, 10k, 200k Ohm – 5 each) – Always good to have a mix of resistors to work with, especially if you’re giving people breadboards to plug stuff into. 4 x BC547 NPN Transistors – Transistors are the basis of modern electronics. They are in everything, including quite a few in that Arduino up there. While they’re definitely cool, I’m not sure about their inclusion here. Most of what you do with transistors can be easily accomplished with Arduino programming, and most projects aren’t going to be large enough or complex enough to encourage the use of Transistors. That said, they’re a basic component of learning electronics, so why not? 2 x Opto-isolators – I didn’t know what an Opto-isolator was until a few minutes ago. It’s a little IC that has an LED (InfraRed) and a little photodetector (or light sensor) that’s all wrapped in a light-tight housing. You can use them to eliminate electrical noise or to transmit signals between different voltages. Freeduino Board (100% Arduino Compatible Clone) – “What does that mean!? !” You say… It means that your Arduino is not an official Arduino board, but instead, a compatible board. It doesn’t say on the site, but I’m guessing they give you this board, instead of this one. What does that mean for you? It means your board will be orange instead of blue. The Freeduino board is 100% compatible with all hardware and software for the Arduino. The people who created Arduino intended the design to work like that. There’s a whole bunch of different Arduino-compatible boards out there. Anyway, the point of all this is: Don’t shy away from this because it’s not an official Arduino board. You can still do everything you want with zero problems. USB A to B Cable – Don’t know how long. Expect 3′ to be on the safe side. “The Complete Beginners Guide to the Arduino” eBook – According to the listing, this book has more than a dozen projects for you to do with your new Arduino. Smart to make it an eBook. Additionally, there are links to code provided. Note: Mike, who runs Earthshine Design and is very active in the Arduino Community, has decided to release this book freely. This is way cool as it provides a learning opportunity not limited to only those who buy the kit. I think this is a great way to promote Earthshine and provide something for the community. You can get the book here. 9v DC Power Supply (UK Socket) – A UK plug to get the power you need for your Arduino. Full Size (700 tie points) Breadboard – This is a welcome addition. A full size breadboard. I like the mini-boards, but it’s nice to know there’s someone out there considering what you’re trying to do. Red Diffused, Green Diffused, Yellow Diffused, Red, Green, Blue LEDs (10 each) – Yeah, that’s 60 LEDs right there. The latter 3 are clear. 100, 150, 240, 470, 1k, 1k5, 1M Ohm resistors (10 each) – For someone getting started (as I’m sure I mentioned before), having a good selection of resistors is essential. I’m glad to see the wide range. 5 Tactile Switches – Buttons! LM35DT Temperature Sensor – Rises an falls in temperature could provide for some cool projects. 4K7 Potentiometer – Another common item. Nice to have. 3-Way Terminal Block – This is a block screw down posts to make it easy to connect and disconnect wires to an from connections. Useful during prototyping. Piezoelectric Sounder – Make noise with this… but don’t plan on it being pretty. 75 Piece Molded-End Jumper Wire Kit – I think it goes without saying that you need wires. Quality 7 Compartment Raaco Case – This is a great point of all of these kits. If you’re getting started in electronics, you’ll quickly find that the random doodads that you’re picking up have nowhere to go in your house. Having a little case to stick them in is really indispensable. This is a BIG kit. A lot bigger than what I was expecting for a starter kit. The strength of the kit lies in the projects that they give you to do. More than a dozen projects to learn with and the components that you need to complete them. I think as you go through these projects you’ll find that you’re learning the things that you need to make your own projects, and realize the things you’d like to build. The price for the kit is £49.99 or about $81.00 US. A parts breakdown, makes it more than £53.00 (Not all parts were available to price), so you do get a price break. However, it is a little high when you’re looking to get into the basics. 12 Flexible Wire Jumpers – All Male it looks like, which is good. 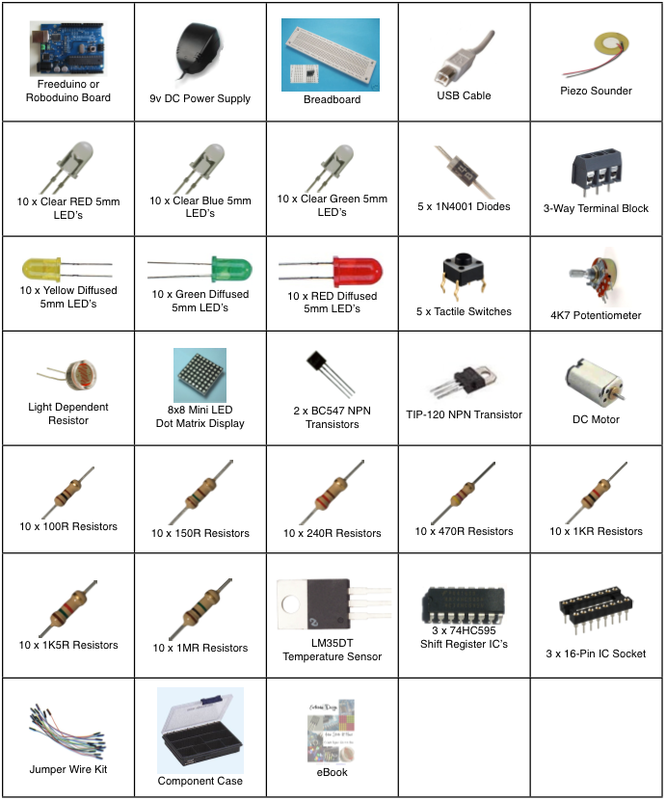 330, 680, 1k, 4.7k, 10k Ohm Resistors (5 each) – A wide selection of resistors is great. 1 Tactile Push Button – Many of the cool things that you’ll want to do has to do with pressing buttons to get responses out of the Arduino. 1 USB Cable for programming and powering the board – From the picture, it looks to be a 6 foot cable. MakerShed is the store corner of Make Magazine, and a way for them to provide parts and materials for the projects they show off in the magazine. When I started writing this I was actually looking at the kit they’re retiring. They’ve since replaced it with 3 kits for different needs: The Arduino Projects Pack, the Advanced Arduino Starter Kit, and this one – the Getting Started with Arduino Kit. If you get a chance, I recommend you look at all three as they vary to suit needs. Getting Started with Arduino book – I have a copy of this book myself, though I got it long after I’d gotten started with my Arduino. It’s a good little book that covers history, and explains basic concepts of programming and electronics. USB Cable – They don’t say, but the previous kit’s cable was 3 feet. I’d guess the same for this one. 1K & 10K Ohm Resistors (10 each) – A couple different values to meet your needs. 1 Tactile Switch – It’s a button. 1 Photoresistor – See the light! Or at least change resistance based on it. 2 Force Sensing Resistors – With these, you can sense force, like how heavy something might be, based on the force it’s pushing against one of these. LEDs: 1 Red, 1 Green, 1 Superbright Blue, & 1 RGB (1 each) – A good mix of Colors. While I think I’d want a few more of each, I can’t really tell you why you’d need them. 4 LEDs is a good set for a starter package. Breadboard – Nothing is stated explicitly about this breadboard, but the picture for the thing seems to imply that it’s a pretty large one. 9V Battery Pack w/DC Plug – This is a nice extra to have. Giving you an easy option of powering your Arduino away from the computer. It’s not a necessity, and I’m not too fond of the external power supply, as it doesn’t give you the right voltage out of the 3v3 pin. Still nice to have. Also, you get a 9v Battery to go with it. MakerShed’s kit is a good one for a beginner. If nothing else, the inclusion of the “Getting Started” book is a good move. All of the information in the book can be found online, but not all in the same place, and often not as well written. The kit has enough going for it that I would recommend it for someone actually entering the Arduino field for the first time. The kit comes at $69.95, which is a little steep for a kit, but you’re getting some good stuff. Ala Carte, I estimate this stuff would probably run you about $90 give or take (not all components were available separately, so I had to guess at the costs.) In that light, it’s a very good deal. Breadboard – A nicely sized Breadboard. Acrylic Holder – As near as I can tell, this device holds your Arduino and Your breadboard together in a fashion that make it’s easy to work with the pair. If you’ve never worked with an Arduino before, it can be difficult to get your boards to cooperate in the same space. The Arduino isn’t heavy, and wires can provide a lot of tension. 75 Piece Jumper Wire Bundle – This looks to be the standard in most of the kits I’ve looked at, some offer more or less. I think 75 is good. I currently have 30 and I haven’t managed to use them all. Printed 29 page Experimenter’s Guide & 11+1 Breadboard Layout Sheets – This is where I think this kit really shines. It comes not only with a book that gives you starting points and projects to work on, but it gives you overlays that will fit on the included breadboard. Copying a schematic can be difficult sometimes, especially for beginners. With this, you just place the sheet on the breadboard, and start sticking components through where they’re marked. For me, doing is worth more than just reading about, so this practice I expect will help beginners. I hope very much that the guide includes circuit schematics. This is a great tool to teach schematic reading. USB Cable – I don’t know how long it is. When in doubt, expect 3ft. Multi-compartment Plastic Storage Box – I kind of think every kit should have one of these, but really it’s probably more just the kits that are designed for beginners. Red, Green (5mm), Red (10mm) LEDs (10 each) – A good selection. Toy Motor – I’m gonna guess that this is a 3v3 motor, possibly 5v. Mini Servo Motor – The first inclusion of a servo, I think this is more valuable than a DC motor. This is easier to control than a vanilla motor, and the libraries available for Arduino are solid. 8-Bit Shift Register – Glad to see this again, as a method of preserving pins for other uses. Piezo Element – Hooray for obnoxious noise! Pushbuttons (2) – Buttons are an absolute necessity. Potentiometer 10K ohm – Adjustable Resistance is also a necessity in doing a lot of cool stuff. The pot they give you is big, but it’s nice to have a large knob to turn… The pots that I have right now need to be turned via screwdriver, and it’s a pain in the neck. Photo Resistor – How bright is it? Temperature Sensor (TMP36) How warm is it? Transistors – Again, I think they have a plan for these. I don’t know that they belong in a beginner kit, but if there’s a project utilizing them, it can be a good opportunity. Resistors 560 Ohm (25) 2.2k Ohm (3), 10k Ohm (3) – You need a variety of these. I suspect the values they’ve given you apply in the pack. Diodes – Keep your power going the right direction. Oomlout also offers their kit in variations. You can buy it without the Arduino or without the Arduino and no project guide/breadboard layovers. I like the “levels” of kit available. I would have loved to be able to buy a kit minus the Arduino back when I first got one. I was so thrilled about getting the Arduino I didn’t think about other stuff I might need. When I looked at Sparkfun vs Adafruit’s kits, I found them to be sort of in that equal-but-opposite situation. As you may recall, The Sparkfun kit had a bit more variety to it. Adafruit’s kit was much more focused towards the person who didn’t have experience doing electronics. The two remaining kits are the MakerShed, and Hacktronics. 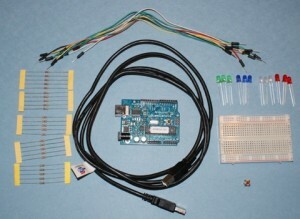 The Hacktronics kit is, to me, about as barebones as you can get when it comes to an Arduino kit. Not too much included, but not too little either. It’ll give you a few things to mess around with if this is your first foray into Microcontroller programming. A button, some lights. Makershed does a bit better. They include the Arduino Book, and a few more types of sensors. So we get a few things to play around with and some instructions on what to do. The book is a good choice because It not only gives you an overview of basic electronics, but also an overview of the Arduino itself. The ideas behind it and the goals of the project. It will get you in the right mode when you get going with your Arduino. All in all, I still favor Adafruit’s kit most. It provides the most complete experience. On the European side, the kits I’ve looked at are pretty dang cool. My top choice is defintely the kit from Oomlout. They’ve put together a solid kit with lots of room for growth. As I said though, it’s spendy. The Cool Components kit gives you something to do, but not a lot. Like the Hacktronics kit, there’s nowhere to go but up. The Earthshine kit is HUGE and comes in just a bit under the Oomout. Both are strong kits, the thing that pushes it over the edge for me is those breadboard overlays. They’re just a really smart idea. That said, if you’re willing to play around with an Arduino, you probably don’t need a color-by-the-numbers concept. You can figure it out! You’re smart! Okay… I’m sick of looking at Arduino Kits. I hope this guide is useful. If I recover from this exercise, I’ll put together a useful kind of table that compares things better. Good luck with your Arduino experiences. If you have questions, or whatever, leave a comment. My guess is that the transistors, diodes, and optoisolators are mostly for driving motors. The inductance in a motor can cause problems for digital devices if you’re not careful. The transistors also allow for higher current and voltage than the arduino can supply/stand. Normally they should be used as low side switches. 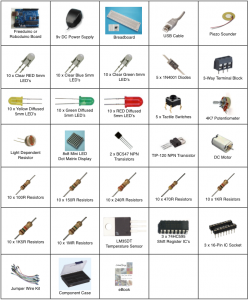 See: http://www.opencircuits.com/Basic_Circuits_and_Circuit_Building_Blocks#Transistor_Low_Side_Switch for example. FYI: You can buy the Oomlout kit from Adafruit, which nicely solves the cross-the-pond problem for that kit. The instruction book includes the schematics for each experiment, along with the parts list, code, and a ‘make it better’ section. The plastic parts box is absolutely jammed on arrival, but it will get better once you pull out the Arduino, breadboard, and the plexiglas backplate. 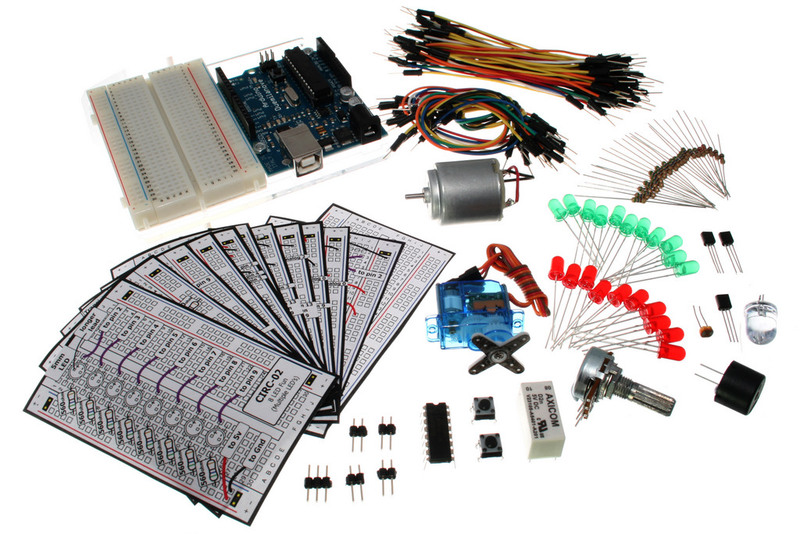 I started with the Make kit, and have since moved upwards and outwards, but the Oomlout kit intrigued me — I think it would make a good instructional kit for a half-day class devoted to Arduino. The original Make kit included _Making Things Talk_, because the Arduino book wasn’t available yet. I *really* recommend this book if you’re planning to hook any microcontroller to something else. It will keep you from reinventing the wheel. “Making Things Talk” has been on my list of books to get since I first picked it up. I was slightly disappointed when MAKE split their kits into different options, as I think this book is awesome. I don’t even own it yet, but the 10 minutes I spent with it at the bookstore gave me every reason to buy it. I’m just waiting for some spending money to pick it up. FYI for anyone interested in this book, you can buy it direct from O’Reilly directly and get a DRM-free PDF and the printed book for almost as much as the print-copy alone. Great deal. I bought the Earthshine Design kit as it seemed to be good value for money for the large list of componenets you get with it. I have to say I was not dissapointed. The kit is well stocked with plenty to keep you occupied for a long time. The tutorial book (it’s too big to be called a booklet) is excellent with nice clear diagrams and I like the way that each step of the program is explained making it easy to understand for idiots like me. I particularly like the fact that with this kit, as it is so well stocked, that I don’t have to go out and buy further parts right after buying the kit. The Cool Components kit has options that you can chose to expand the kit – A servo controller, a servo and a digital accelerometer. When bought with the kit they’re cheaper than when bought singly. I bought mine 2 months ago, and I’m still using it, albeit with some additional parts. I guess the point is that ALL of these kits are starter kits – they’re never going to be all things to all people, and the user is always going to (quickly hopefully) outgrow them. That’s the idea isn’t it? Also – not so sure about the printed material in the Ooooflout and Earthshine kits – there’s shed loads of stuff on the internet for free?! You’re right in that there is a TON of material available online. It’s wonderful to have so many people lending towards that. The trouble is, it’s often incomplete or working at mixed levels. The advantage of a single piece of writing is that the author is going to take you through at a particular pace, through particular kinds of material. It’s uniform by virtue of being from one source. This is very helpful for a beginner. Additionally, not everyone is good at finding information online. Because of that, our forums get filled up with questions like “How do I blink an LED with Arduino” even though it’s a very common beginning point that’s been covered a lot. Sure. My point is that I wouldn’t want to pay for printed material when there’s so much information (mostly well written) out there. If people are asking in your forum how to blink an LED then they are dufuses surely? Thanks for taking the time to write this up! I wanted to buy a kit for my husband & kids for christmas, and knew nothing about them. Your review made it so much easier to figure out what I wanted. I’m glad you found it to be useful! I think it was definitely needed, and it’s great to know it’s helping people. I’m curious, What kit did you end up choosing? I’m sure, whatever the kit, your family will have a blast. Merry Christmas! Thanks for the review, made it easy for me to decide which one to buy as I don’t have idea of this kind of stuff. I’m sure my boyfriend would enjoy it a lot. A new toy for Xmas!!! I think I’ll buy the Earthshine one. I’m glad you like them. If you end up getting a kit, drop a line here and let me know what you decided on. I always like to know who decided on which kit and why. I purchased the Earthshine Design Starter Kit and have to say I was very impressed. The kit has a huge quantity of parts so is great value for money. The book is brilliant. Really well written and aimed at beginners. I found it very easy to follow and meant I learnt the basics very quickly. As for what Barry M says – The printed material is a free part of the kit. The Earthshine Design manual can be downloaded for free from their website even if your not purchasing the kit. You can count me in for a Digg. Thanks for posting this on your site! Great to find that someone has had the generosity to spend time on this and share it with us all, thank you! 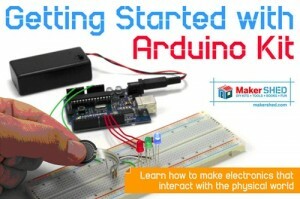 I am a total noob to the Arduino and electronics so your article has been really helpful. Great help. Looks like quite a bit of effort, so thank you very much. Decided to get into Arduino as I’m a mechanical engineer and could really do with some easy electronics knowledge to help me test stuff on the cheap. Went for the Oomlout pack because it looks like it’ll be worth the extra bit of cash just to get up that learning curve a little quicker. Looking forward to peering into some blinking lights! Cool. The Oomlout pack is definitely a solid choice. Provides a lot of stuff to work with. Best of luck! Great article. Thank you. I did see in the Arduino forums that you are expecting to update this yet again. Do you have a rough idea when an update might be out? Thank you for the kind words. I’m hoping to have it ready in a week or two. The updated version is going to have a comparison chart outlining the different kits, as well as the reviews. The new version is going to be driven by a database and some dynamic stuff, which will hopefully make it even more useful. I’ve ordered a kit from Earthshine. Is a nice kit but wont be buying from this site again. Service us terrible and took 2 weeks to receive kit! Hardly received any emails or had any replied to. Thanks for your thorough review of starter kits – really helpful for a complete novice on a budget looking to get started. Thanks for this, a very helpful review. Hey – thanks for writing this up. 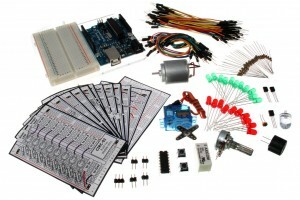 I’m just about to get into Arduino and was looking at starter packs (in the UK!) so this was really helpful. Going to go with the Oomlaut which, as it turns it, is the first one I came across, and now I feel good about it. Cheers. Excellent stuff Aaron. I will buy a UK kit off the back of this info. Now just to decide which one! Thanks. I was torn between playing with control units for static projects, for which an LED matrix would be useful perhaps, or playing with robotics projects, for which servos would be much more useful. Either way once ive settled in to arduino, im sure i can make a trip to radioshack or similar and peruse the extra parts i could play with. FWIW, i went for the Oomout one. despite having an A level in electronics, that was some years ago, the revision will stand me in good stead. Thanks a million for this. I think I’ll try Oomout, to get that first blink, based on the relay included. Which is ultimately where I want to get to. Thanks again … Really, really helpful!